Just like the World, we were in awe as we were witness to Israel's Foray to the Moon. 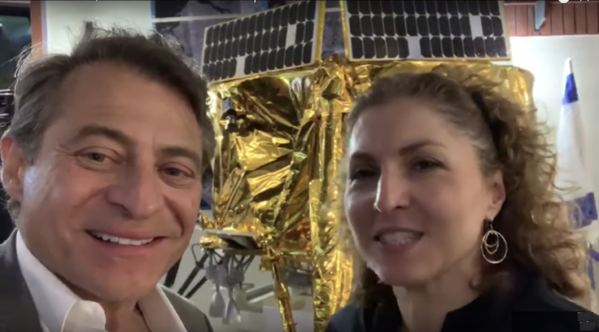 We are pleased to present this retrospective courtesy of Peter DIamandis as we congratulate Israel on this mission--the future is indeed bright!!! In late February 2019, twelve years later, SpaceIL launched its lunar-bound Beresheet spacecraft on top of a SpaceX Falcon 9. I traveled to Israel this past week to join the SpaceIL team in Beresheet mission control for this historic attempt. This blog is my reflection on the electrifying mission of the first private lunar spacecraft. Why Did We Launch This Prize, and Why Did Google Fund It? To inspire the next generation of scientists, engineers, and innovators to take moonshots. 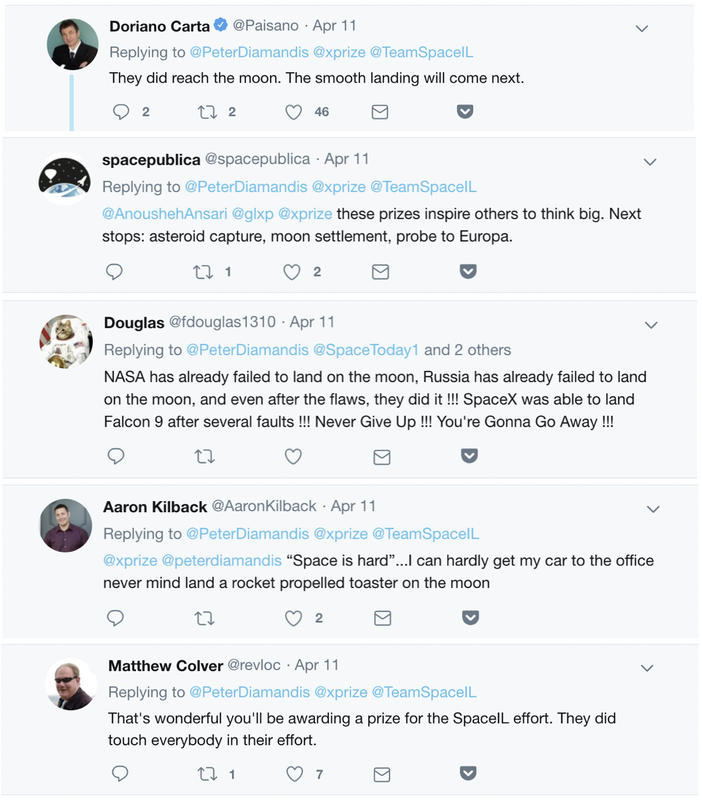 To spur affordable access to the Moon and give space entrepreneurs a legitimate platform to develop long-term business models around lunar transportation. The Hero’s Journey of the SpaceIL Team: Imagine three young entrepreneurs who passionately and naively set out to land a mission on the Moon. No funding and no hardware experience. They would go on to raise $100 million, and to build the Beresheet spacecraft with a team of fewer than 50 engineers. A Visionary Funder: We also celebrate the vision and passion of Morris Kahn, a South African-born, Israeli billionaire who was so moved by the passion of the SpaceIL Founders that he committed nearly $50 million to fund the hardware development and launch. The Impact on Children & Adults: Having spent the last week in Israel, I know that team SpaceIL and the Beresheet spacecraft were known by every schoolchild and on the lips of everyone in conversation. Everywhere I’ve traveled in Israel over the past week, people young and old congratulated the XPRIZE Foundation over and over again for inspiring this mission. Making History: The Beresheet spacecraft made history more than once on its exciting journey, including: (1) Being the first private company to orbit the Moon and touch the Moon’s surface; (2) Making Israel the seventh nation (behind the U.S., Russia, China, Japan, the European Space Agency, and India) to orbit the Moon, the fourth country to attempt a soft landing on the Moon, and the fourth country to touch the Moon’s surface. Taking moonshots is by definition difficult, and the outcome of SpaceIL’s mission goes to show that these world-changing prize competitions are far from easy to win. At the same time, space in particular is extremely hard… for now. Ultimately, Anousheh Ansari (XPRIZE CEO) and I decided to give the team a $1 million 'Moonshot Award,' despite their “kinetic disassembly,” as an encouragement for them to continue the pursuit of their mission, and to launch Beresheet 2.0. See the video announcement of our $1 Million Moonshot Award to SpaceIL (by clicking on the image above)! Space exploration and failure are intimately linked: nearly every nation and company to reach for the stars has first failed spectacularly at their direct objective. Yesterday I personally spoke to Morris Kahn, and was thrilled to hear his announcement on nationwide TV. “... In light of all of the support that I’ve got, from all over the world, and the wonderful messages of support and encouragement and excitement, I’ve decided that we are going to actually establish Beresheet Shtaim [Beresheet 2]. The team’s courageous persistence to the point of success is a powerful testament that will continue to inspire millions of children and innovators in Israel and across the globe. Without a doubt, SpaceIL and Beresheet propelled the private space industry into a new era. I am grateful to the SpaceIL team for their dedication and courage in pursuing the goal of the Lunar XPRIZE and connecting millions of children across the world to science, technology, engineering, and space. I am proud that the XPRIZE Foundation is supporting Beresheet 2.0 with a $1 million award and can’t wait to see Beresheet 2.0 land on the Moon.